A blind man and his guide dog show the power of trust and courage in the midst of devastating terror. It was 12:30 a.m. on 9/11 and Roselle whimpered at Michael’s bedside. A thunderstorm was headed east, and she could sense the distant rumbles while her owners slept. As a trained guide dog, when she was “on the clock” nothing could faze her. But that morning, without her harness, she was free to be scared, and she nudged Michael’s hand with her wet nose as it draped over the bedside toward the floor. She needed him to wake up. With a busy day of meetings and an important presentation ahead, Michael slumped out of bed, headed to his home office, and started chipping away at his daunting workload. Roselle, shivering, took her normal spot at his feet and rode out the storm while he typed. By all indications it was going to be a normal day. A busy day, but normal nonetheless. Until they went into the office. 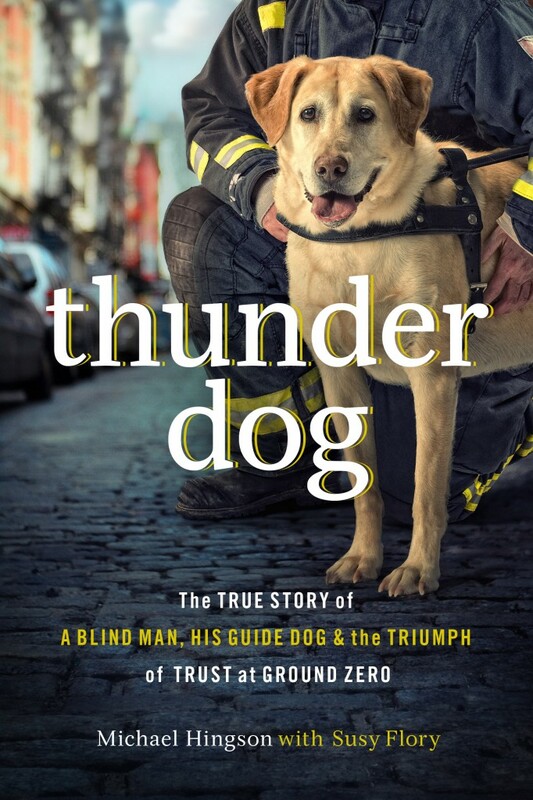 In Thunder Dog, follow Michael and his guide dog, Roselle, as their lives are changed forever by two explosions and 1,463 stairs. When the first plane struck Tower One, an enormous boom, frightening sounds, and muffled voices swept through Michael’s office while shards of glass and burning scraps of paper fell outside the windows. But in this harrowing story of trust and courage, discover how blindness and a bond between dog and man saved lives and brought hope during one of America’s darkest days. My feelings about this book are mixed. Although I enjoyed most of the book, it wasn’t what I thought it was going to be. I thought, because of the title and cover, that the book would be about Michael and Roselle’s Sept. 11, 2001 escape from the twin towers. But a huge part of the book was about his life as a blind person. He tells us what he and other blind people face on a day to day basis, and how he learned to overcome most of the obstacles he has encountered, mostly due to the way his parents raised him. I would have loved if the author had written two books, one on his experience on Sept. 11th, and the other on his life as a blind person. Both are interesting enough that I would have enjoyed them more as seperate books. That being said, I’ve read reviews from others that thought the book was fantastic just the way it is. For me, I just wanted, and was expecting, this book to just be an account of that horrific day. The courage of Michael and Roselle was amazing to me. I can’t imagine being in that situation, much less being in that situation and being blind. Being able to get an idea of what that day was like through the authors vivid descriptions gave me a better understanding of what everyone in the towers that day went through. Roselle was an amazing dog and I was suprised at how upset I was to learn that she had died in June. Well if 9/11 was mentioned in the synopsis, anyone would think it is on that. I would be disappointed a bit too. I will keep this in mind if I get a chance to read this. I'm so amazed by guide dogs and think I'd probably enjoy this book for that aspect alone.